Congratulations on being chosen to receive a donation through the Big Y Community Bag or Giving Tag Program! This toolkit is for non-profits who have been selected as a monthly benefiting non-profit by store leadership. This toolkit equips you with everything you need to get the word out during your selected month. 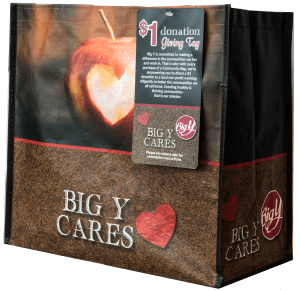 This toolkit is for non-profits who participating in the Giving Tag program.Your supporters can go into any Big Y store and purchase the Community Bag with the Giving Tag and direct their $1 donation to your non-profit at any time throughout the year.